Canadian Patrice Haan grew up singing. Born into a musical family, she played piano and church organ before taking up the lever harp in her thirties. After moving to the San Francisco Bay-area in 1998, she plunged into the music scene, where she is known for her vocal performances with the Oakland-based jazz ensemble, Leftover Dreams, as well as diverse folk and jazz artists. Her solo appearances are called “deeply moving” and her tunes have been described as “beautiful, gorgeous, poetic and evocative, healing our souls and our heartache with the palpable love and the poetry of the music.” She has played in coffeehouses and concerts in two Canadian provinces and six states in settings as varied as the main stage at the Strawberry Music Festival, a cruise to Alaska, and First Night Monterey. Increasingly recognized for her songwriting, and with two solo albums to her credit, Bluest Blue (2011) and Headed Home (2005), Patrice has also appeared on numerous recordings as both a vocalist and harper. 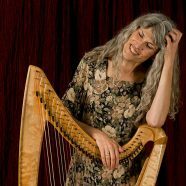 The newest album of Healing Muses, entitled A Garden of Healing, includes two of her original songs and a vocal performance. 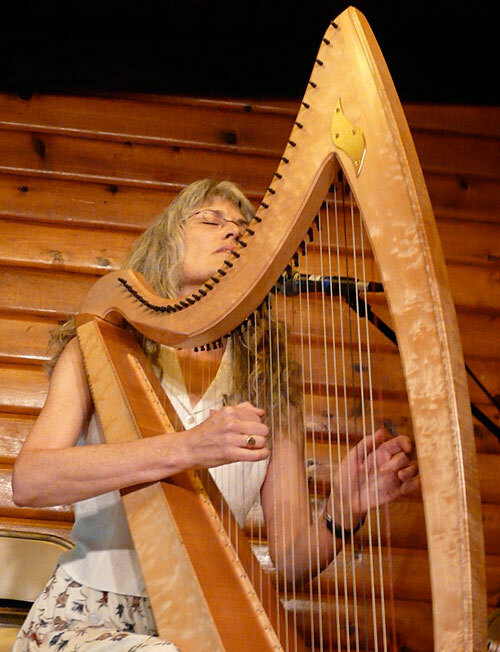 I’ve interviewed quite a few songwriters over the years who also happen to be fine guitar players, but I think you’re the first whose primary instrument is the harp. So to be begin, I’d like to ask you what makes a good harper? In the old Irish stories, three feats reveal a master harper: the deep murmuring which causes sleep, the merriment which causes laughter, and the melting plaintiveness which causes crying. Oddly enough laughter, dancing and war are often associated; people get worked up. I think we know enough about going to war so it’s time to laugh and dance. I also think that water heals and crying is often a way to great healing. If someone falls asleep or if they cry while I’m playing, I am honoured. The harp tickles the ear in a unique way. Sometimes people listen without apparently listening. There may be an outcome that I never see. My personal challenge is to attend*, keep listening myself, and trust the music. Tell me a bit about how you originally became interested in writing original music, and how this path has unfolded for you so far. I had dabbled a little when I was in university. I sang a lot of folk music (though I never did learn to play guitar) and took a crack at a song or two. I always wrote poetry. But when I returned to music after a long silent period, one of the first gatherings I attended was a music camp for adults. I intended to sit in on the songwriting class, but the teacher insisted I either join or leave. The first song that came out tore all my defenses apart and damn near killed me. But it also saved my life. My grief, my Big Feelings could be transmuted into something lovely, if only to me. Recently I heard a provocative TED talk by Liz Gilbert in which she talks about the genius of a thing. A song is itself and it isn’t me who is the genius; I’m a radio and hopefully I’m turned on. And maybe the song will use me to be heard. All I can offer is to transcribe it to the best of my ability. In a number of your interviews, writers talk about composing and singing from the heart. I believe passionately this is how we transmute the world, ourselves first. That’s what I mean by the medicine of music. 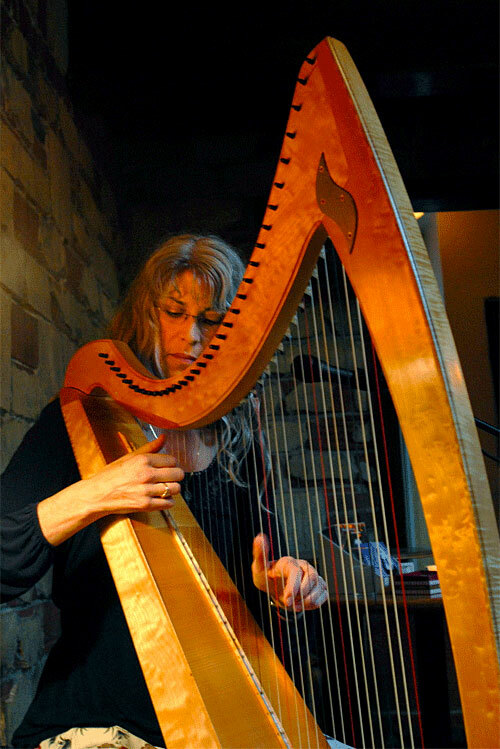 Patrice Haan plays the harp at le Bateau Ivre in Berkeley, California on August 31, 2011. When you begin writing a new song, tell me about the context. Do you set structured time aside specifically to write or is it more inspirationally driven? Given my previous answer it sounds like I waltz around all day listening for song-genii passing by; some weird chick with a butterfly net. Occasionally that happens, and what a rush that is! Inspiration strikes in the car on long drives, early in the morning if I’m writing and drinking my morning tea, if I’m improvising while I’m on a quiet hospital ward (I play several hours a week in hospital wards and waiting rooms), and at one favourite lake in the NW. More commonly, I have a deadline. I meet monthly with a circle of songwriters and another of poets. More sporadically I gather with tiny circle of friends who are master editors. So my deadline makes me sit at the piano or harp or hum a lot. I’m casting out my line, listening for a tune or a phrase. I’m a sucker for melody; the melody of a tune or a line of words will hook my interest and set me off on a quest. Lately I’ve been experimenting with setting some of my poems, so those experiments are as much rhythm-based as melodic. But I’m not interested unless there is melody. Once or twice I’ve written something to order in a class or as a challenge, that is a theme, a form, a groove, a feel, but oh, that’s hard work! And if I don’t really like it I won’t keep it. I don’t know that I buy the advice to write 100 bad songs to get them out of the way. I won’t invest a lot of time in a song that I don’t believe in. If it gets in my ear, I’m hooked. Your songwriting has been described as beautiful, healing, and poetic. Are these qualities achieved by intention or are there other variables involved? I long to make songs that can be so described, so yes, my intention is to make medicine songs. My medicine. I have no pretensions about me healing the world, but if I can mend my own heart, heal up my own bruises, I want to go there. I love melody, I love poetry, I adore harmony. The songs I write or catch, as the case may be, are as beautiful as I can make them, even if it is fierce beauty or funny beauty. I suppose it bears saying that beautiful is not always pretty. Nor is poetic pretty. But it’s true and the heart knows that. Are there any particular songwriters you enjoy listening to for enjoyment or inspiration? I don’t suppose there’s a woman of my age who would not list Joni Mitchell among her starry influences. James Taylor, Cindy Kallet, Jessie Winchester for brevity and story. And I love the writers of the classics: the Gershwins, Jimmy van Heusen, Johnny Mercer. I love traditional songs. But up-close and regular, the people I meet with, my monthly gang and the Secret Song Society, inspire me with their imagination and bravery and skill and heart. The way we sit and listen/attend to one another is a profound gift. As someone who has thought a lot about the topic of songwriting, both as a creator and listener, what hints or tips on songwriting can you offer to others who are on this path themselves? Curiosity and desire for truth are good companions. A composer whose work I admire deeply, John Miller, told me, “Start away from your instrument. You will always be limited by what you can play.” So step away from the guitar, piano, mando. Go for a walk and hum to yourself. Find a tune. Then listen hard to what it sounds like. Is it sad? Silly? Cool? Pensive? Or start with a word or a few words. Did you hear something that moved you? Think about that a little, maybe scribble down some ideas. Don’t fuss about rhyme and rhythm yet. Just hook the fish; you can land it later. When you get to editing, be as ruthless as you can be. Don’t cheat on scansion; squashing in an extra two syllables is cheating and lumpy. Rhyme kindly if you’re going to rhyme. You are a craftsperson, so craft! Expect a lot from yourself. Speaking of listening and having fun, I understand that you’ve recently begun teaching a series of classes and workshops in listening. Tell me more about the topic and why you’re motivated to teach these workshops. I was invited to teach a second class at a singing conference. I wondered what I could offer that was unique to me. I love to listen, and I think we could all stand to improve our skills, and I mean everyone, not just musicians. It seemed to me to be a great adjunct class at a music workshop to practice listening. We learn by listening. We notice. We build trust and make community. It’s delirious fun, too! Think about how you’d most like someone to receive your music. My heart opens when someone really listens to me. Can you be that attentive and open to someone else? When you are really listening with curiosity, you can learn so much. I didn’t say it isn’t hard, but it’s fun. Hear how those words echo each other’s shapes, how the music grabs and lifts that word, how that pause makes you gasp? Good listeners make their own music that much better for having paid attention. And when it comes to matching voices, finding harmonies, getting the groove, playing well with others, listening is the core. Besides, it might save the world. How can people find out more about the Listening workshops? Talk to me. Write me. I am passionate about this and yet it’s just beginning to bubble up from underground. I’ve spent many years being subversive, listening and teaching from the sidelines. But every teacher I’ve spoken with about this workshop, lights up. Maybe it’s time to listen up people!